If you’ve been using commercially prepared almond milk (store-bought) as part of your healthy nutrition routine, then there are a few things you need to know. Many health conscience consumers believe they are doing their body good by replacing regular dairy milk with almond milk. While it’s true that raw almonds are a great source protein, healthy fats, and antioxidants, believe it or not, commercially prepared almond milk is quite a different story. Here’s the good news: It’s very easy to make your own almond milk, and there are many health benefits to making your own almond milk, but here are top three. Almonds are low in saturated fatty acids, rich in unsaturated fatty acids, and contain dietary fiber, antioxidants, vitamins like riboflavin, trace minerals like magnesium, and plant proteins. They contain a wide range of nutrients and compounds that are often lacking in our diets. Homemade almond milk is also packed with these beneficial nutrients. When making almond milk, step one is to soak the almonds before you make the milk. This removes the phytic acid and enzyme inhibitors in almonds which interfere with digestion and draw vital nutrients from your body. Please note that nut allergies will still exist in homemade almond milk, but by soaking the almonds and allowing the germination process to begin, the enzyme inhibitors are deactivated, which increases the available nutrition of the nut significantly and can help make them easier to digest for those who experience difficulty digesting nuts. As compared to commercially prepared almond milks, when you make your own there is a higher ratio of almonds to water. In fact, studies suggest that there is less than a handful of actual almonds in store-bought brands. This means that the almond milk you are buying is mostly water and could contain additives and thickening agents like carrageenan which has been shown to be a carcinogen. By making your own, you are ensuring that there are no artificial ingredients and your almond milk will be packed with nutrients your body needs. My recommendation is one cup of almonds to four cups of filtered water. You can use more water for thinner milk, or less for thicker milk. You can also add vanilla extract and stevia for flavor and sweetness, I recommend organic, of course. For those of you who are using your milk for smoothies, you may want to skip adding these to the milk and add your stevia and vanilla extract to the smoothie you are making. 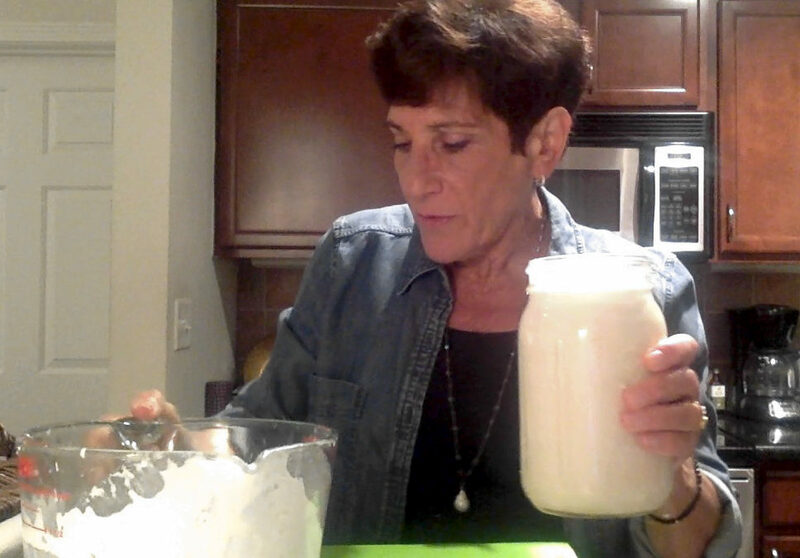 When you taste your homemade almond milk, you will notice the distinct almond flavor, as to the very little to no almond taste in commercial brands, which are mostly water. All you need are almonds, filtered water, and a blender (Vitamix, Nutribullet, or similar) to make nutritious, and delicious almond milk. My recipe is below and you can view my video at the end of this article for a hands-on demonstration. Once you have all your ingredients and supplies, you can continue to make homemade almond milk as you need it and store it in the refrigerator for three to four days. When you compare the shelf life of store-bought almond milk, which can be months, it’s clear to see that there must be copious amounts of preservatives which is scary! Your homemade almond milk will be fresh, delicious, and free of additives! After soaking the almonds overnight, rinse thoroughly, drain, and pour them into your blender. Add 4 cups of filtered water (more for thinner milk, less for thicker milk) and blend. For a high powered blender like a Vitamix, about 45 seconds. For other types of blenders, blend for 2 minutes. You will see the milk begin to thicken as you blend. Pour the liquid from your blender through the nut milk bag (or cheesecloth) into your bowl and squeeze gently to expel all of the liquid from the bag or cheesecloth into the bowl. What will be left in the bag is an almond meal-like by product, which can be used for crackers or cookies (click here for recipes), or you can throw it away. The bowl will contain about 5 cups, or a little less, of homemade, delicious and nutritious almond milk! Store your almond milk in your mason jar or milk bottles in the refrigerator for three to four days, and enjoy! As a health coach, I offer flexible programs for individuals, groups, or corporate events. For more information about the health benefits of making your own almond milk, or any other questions about or how my programs can help you create or maintain a healthy lifestyle, feel free to contact me today.